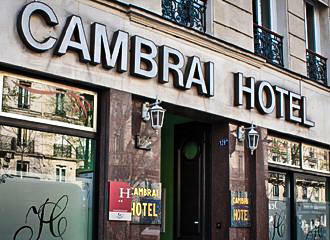 The Hotel Cambrai is a 2 Star Hotel located in the 10th Arrondissement of Paris, which is disabled friendly along with being pet friendly, and has 28 en suite rooms with free WiFi, 24 hour front desk, plus breakfast available. 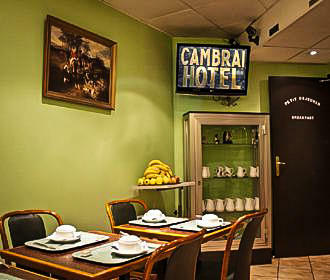 The Hotel Cambrai has 28 rooms with a lift for easier access and some dedicated to the disabled, plus this is a family friendly and pet friendly budget hotel that has a 24 hour reception, with staff able to help you with booking tours, restaurants, etc. There is a dining room where the continental style breakfast is served each morning, however there is also a drinks vending machine and a snack machine available at all hours. Luggage hold is another service that the Hotel Cambrai provides for when you are arriving early or leaving later in the day, in addition to free WiFi internet access and a safe at reception. There are a total of 28 rooms that are singles, twins, doubles and triples, each being accessible by lift and with their own en suite bathrooms that have either a shower or a bath and as we mentioned earlier, some of these are suitable for the disabled. All of the hotel rooms are basic with simple decor, yet come with a TV, direct dial telephone and most have a desk, plus baby cots are available if requested at time of booking, and an extra bed or roll out bed can also be arranged for an additional charge. 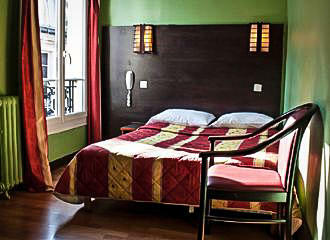 The Hotel Cambrai is located in the 10th Arrondissement of Paris very close to the Gare du Nord train station, which serves the Metro lines 4 and 5 along with the RER B and the RER D lines. However, the Metro station called the Barbes - Rochechouart is approximately 300 metres away that serves lines 2 and 4, yet the Bus Lines 30, 35, 38, 39, 45, 56, 65 and 350 will also get you close by, as will the Noctilien Night Bus service on lines N01, N14, N43 and N44.